Happy Monday everyone! And it is happy, isn’t it? It’s lovely to be at home in the summertime and, thanks to Ms. Tara, we have an awesome linky party to join each Monday! So, I’m still working away at some signs to amp up my old color scheme for this new school year, as well as to get things a little more organized. Today I focused on a little management piece I’ve used in the past, which has really helped me save time: premade notes to the nurse, to fill out quickly when one of my students isn’t feeling well. I used to keep these notes in a plastic sleeve I made, but it’s kind of worn out at this point. So I decided to keep them (along with a pen because I can NEVER seem to find one when I need it!) in one of my bright baskets. (I must confess, I had a terrible urge to buy a new little basket, specifically for this purpose–but I am resisting!!) I have sworn to not buy any more plastic storage. We’ll see if I can stick with this resolution! I’m guessing no…haha! My Circle Cutter–and Special Signs to Share! I wanted to take a moment to let you and your readers know about a big giveaway going on at my blog. There are lots of ways to enter. It's for educational printables from Little Learning Lovies. I hope to see you there! And my goal is to buy more fun baskets because I have too many plain-old-plastic-see-through tubs. BORING! How cute are these?! LOVE them! 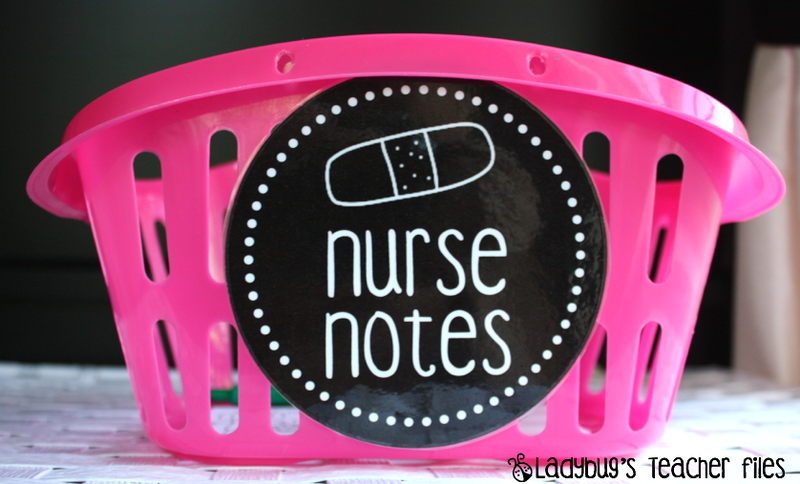 We have premade, boring nurse notes:/ I would love to use yours but would lose my tail….Thanks for linking up friend! I so totally love all your new signs and labels. The white really pops!!!! Your so fabulous. 🙂 Love the idea. that is a great idea. Of course as usual you've made it super cute. Love these!! So generous of you to share, and I really appreciate it! I love this idea! We don't have a nurse but our secretary kinda does that too and we are supposed to write her notes about what the problem is. I usually forget so this will keep me in her good graces. Thanks Kristen! Thanks for sharing! I love this idea! Another great idea!! Thank you Kristen for making me one step closer to being organized!! I love it! Love this!!! Thanks for sharing it!! Very cute! I need to do something like this. We used to have a pass system at my old school, but the new school…not so much. Cute ideas! I also wish I could use it, but we must use district duplicate version although it does make it easy to check off their various ailments. We have to fill out student name, number, teacher name, date, time left and then we have a selection of common ailments we can check off or select other and we can write note. The bottom is reserved for school nurse to write her notes. I also have a little plastic container for bandaids, gloves, hand sanitizer, pen and clinic passes. This is well used in my classroom as I leave it for a sub and I take it with me at recess or field trips. Thanks for sharing! I love your blog and have been inspired by so many of the things you do. I wanted to let you know that you are part of the reason I decided to start a blog… I nominated you for the Versatile Blog and Lovely Blog Award… Check them out at my page. Love your site! 🙂 Love this idea…I made my own notes on Vista Print and the hardest part was remembering to use them, lol. It was so nice to just write.."Temperature" rather than call down, interrupt the secretary/nurse, talk to her and then get back to my patiently waiting class ;)…these were great most of the time and perfect for the info needed. Great idea and notes- Thanks for sharing!! Thanks, Kristen! 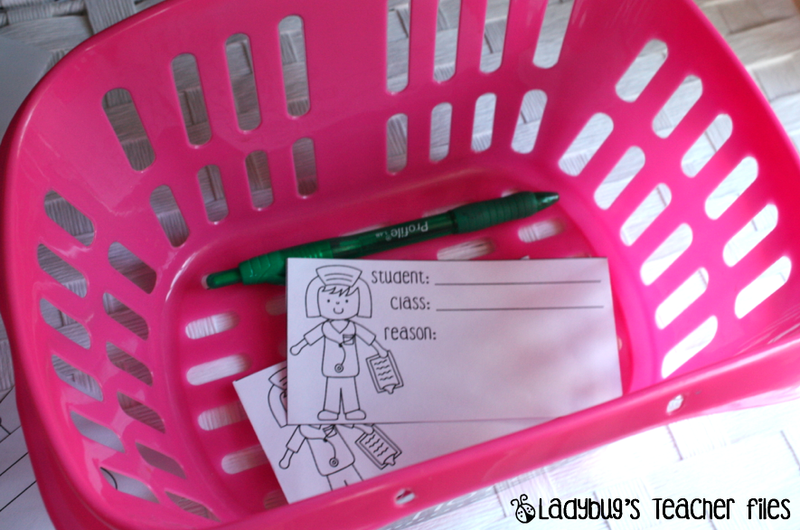 Love these little labels, the font , and the bright baskets! Who doesn't love lots of brightly colored baskets? Did you find those cute little baskets at Dollar Tree? Thanks Patti! I did get them at the Dollar Tree, years back. They have served many purposes over the years! Thanks for sharing Kristen! This is a great idea, and your little notes are too cute!